Mashed Potatoes and Gravy — Happy Food Co.
*Look inside your kit for a 20% OFF coupon for Pryde's Kitchen & Necessities in Westport! If you don't already have a rice mill, we hope you'll use your coupon to purchase one. It's a great little gadget for making dreamy mashed potatoes. 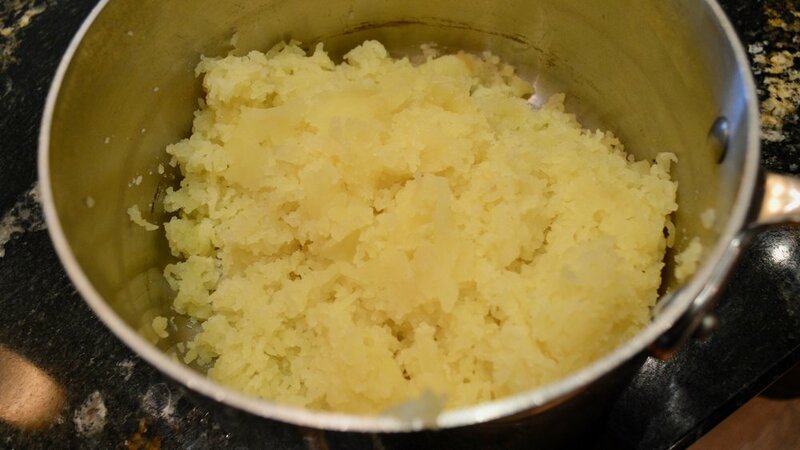 RINSE the yukon gold potatoes and place them in a large pot. COVER the potatoes with water and bring to a boil over high heat. REDUCE heat to medium and simmer until the potatoes are fork-tender, about 20 minutes. MELT 6 butter balls in a medium saucepan over medium-high heat. 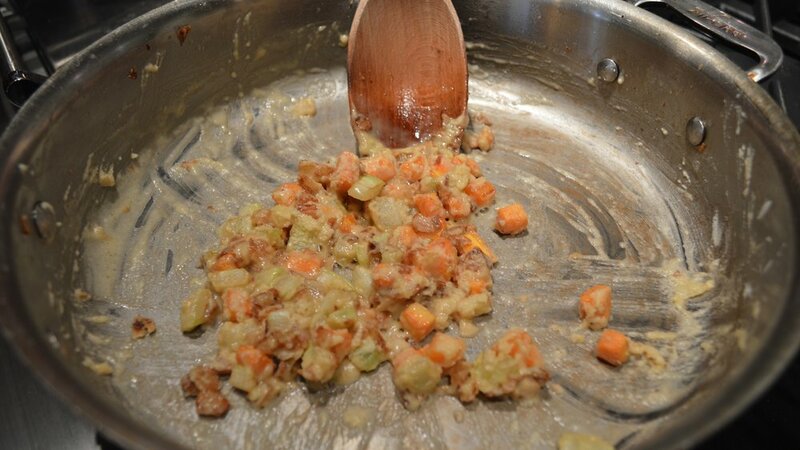 ADD the carrots, celery and onion and cook until softened and golden, about 7 minutes. REDUCE heat to medium and stir in the flour. Continue to cook and stir until browned and fragrant, about 5 minutes. WHISK the full carton of beef broth into the sautéed veggies and increase heat to high, bringing the gravy to a boil. REDUCE heat to medium and add the bay leaf, thyme and peppercorns. SIMMER and stir occasionally until thickened, about 15–20 minutes. Chef K's Method: Place the boiled potatoes in a rice mill and squeeze to "rice" the potatoes back into the large saucepan. Discard the skins. Alternate Method: Remove the skins from the potatoes with a paring knife. Place the potatoes back in the large saucepan and mash gently with a potato masher. ★TIP: See the “Method to Our Madness” flyer in your kit to learn Chef K’s special method for preparing creamy mashed potatoes that will change your life! STRAIN the gravy through a mesh strainer into a serving bowl or gravy boat. Press out all the liquid and discard the solids. MELT the remaining butter balls in the microwave. Stir the butter, salt, pepper and garlic salt into the potatoes. WARM the half-and-half in the microwave and gently stir it into the potatoes. 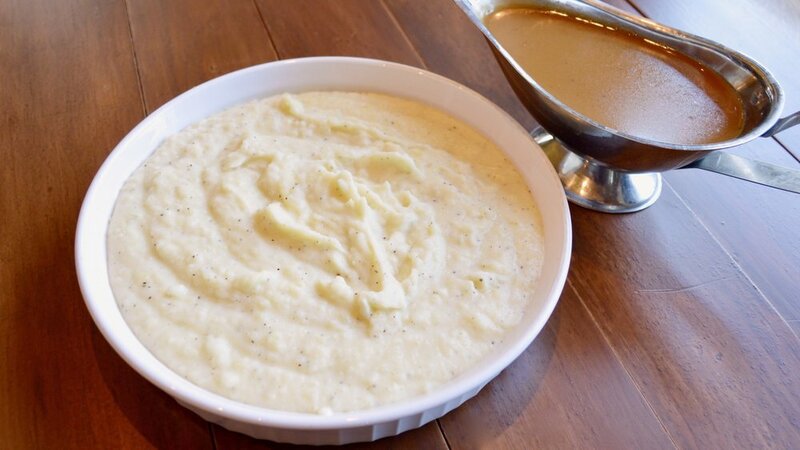 SERVE the mashed potatoes with gravy and enjoy!